You are the most dangerous gunfighter in the West, and in the eyes of the law you're Wanted: Dead or Alive. Click here to play! It's been awhile since you've been back in civilized parts, especially after the bank job in Dodge City went south in a bad way. You're a misunderstood bandit, having only gotten on the wrong side of the law after avenging your brother by shooting down his murderer. Not that you could ever prove anything. Maybe you can redeem yourself in the eyes of polite society by taking out the other bandits that have been terrorizing the folk around these parts for the past few months. Moustache Mike, Neckbeard Nigel and Noseless Bandanna Theodore make up the Viper Gang, one of the deadliest posses in the West. They've been known to show no fear of the local sheriff, playing poker in the saloons and getting into gunfights whenever they lose. The locals have learned, and the Viper Gang hasn't lost in a long time. With the law doing nothing to stop these villains, it's up to you to clean up this town. Who knows, there may even be some money in fighting for the law, what with the Viper Gang carrying some hefty bounties on their heads. 3 to 5 cash sack scatter symbols onscreen triggers the mini-bonus. The mini-bonus is a simple game where you choose a cash sack and get the corresponding prize. Dynamite symbols are wild. Aside from substituting for anything other than bonus and scatter symbols, dynamite also offers some of the biggest payouts. 2 symbols can earn 10 times the payline bet, 3 can earn 100 times the bet, 4 can earn 1000 times the bet, and 5 wild dynamite symbols can earn 10000 times the payline bet. 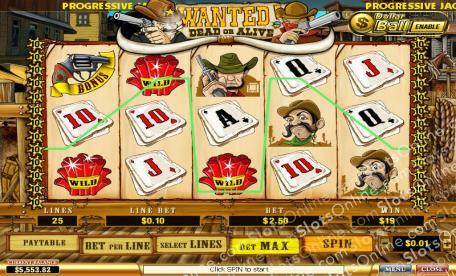 The bonus game is triggered when a bonus revolver symbol appears on reels 1 and 5. The game consists of shooting barrels to find the villain. The fewer bullets it takes, the higher the prize.